Dan Stence Service Details - Lewistown, Pennsylvania | Barr Funeral Home Inc.
— Barr Funeral Home Inc.
Dan L. Stence, 67, of Reedsville, passed away at 10:17 a.m., Wednesday, August 29, 2018 at Geisinger Medical Center- Danville. Born March 21, 1951, in Lewistown, he was the son of the late Harry L. and Marijane (McKalips) Stence Hesketh. In addition to his parents, he was preceded in death by a sister, Pamela Hesketh. Dan will be remembered and missed by his loving wife, Terry L. (Treaster) Stence, his children, Jennifer Conaway and husband Kevin of Reedsville, Kristan Myers and husband Ronald McClure, Jr. of Shirleysburg, and a step-son, Christopher Yohn of Reedsville, Siblings, Karen Roe and husband Ronald, Jeffro ‘J.D.’ and companion Missy Shawver, all of Granville, Tracey Hesketh of Middletown, and William Hesketh III and wife Kerri of Cleveland, OH, Grandchildren, Emily Grace Conaway, and Danica McClure, and step-father, William H. Hesketh. Earlier in life, Dan was employed at The American Viscose Corporation, Menno Township, CNH New Holland, and lastly, owned Coffee Run Country Home. Dan always enjoyed life to the fullest and found pleasure in making others happy. He was a member of the Lewistown Country Club, Mount Union Country Club, American Legion Post 289, and the City Hook and Ladder, which was his pride and joy. When he wasn’t on the golf course or fishing, he enjoyed woodworking, vacationing to Florida, wine making, and spending time with his beloved friends and family. A memorial service in loving memory of Dan will be held at 11:00 a.m. on Wednesday September 5, 2018 at The Barrville Mennonite Church, 48 Barrville Mountain Road, Reedsville, with Rev. Carl Geissinger officiating. There will be a visitation held at Barr Funeral Home Inc. and Crematory, 120 Logan Street, Lewistown on Tuesday September 4, 2018 from 6-8:00 p.m. There will be an additional visitation held at the church from 10:00 a.m. until time of service. In lieu of flowers, memorial contributions in Dan’s memory are respectfully encouraged to The American Cancer Society, 1375 Martin Street, Suite 206, State College, PA 16803 or The Alzheimers Foundation, 3544 N. Progress Avenue, Harrisburg, PA 17110. 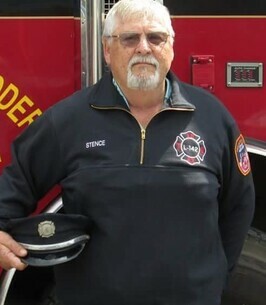 To send flowers to the family of Dan L. Stence, please visit our Heartfelt Sympathies Store. We encourage you to share any memorable photos or stories about Dan . All tributes placed on and purchased through this memorial website will remain on in perpetuity for future generations. My heartfelt condolences to the family. I am praying for comfort during this time of grief. Dear Terri and family. Our thoughts and prayers are with you and your family during this very difficult time of your life. We have so many wonderful memories of Dan and his time here on earth. Unfortunately, it was not an easy road for Dan to stay here with us. It was a very long road for him. He is finally free from all of that pain and no longer has to struggle. He is at peace.